← Get your boat out of the dark ages. 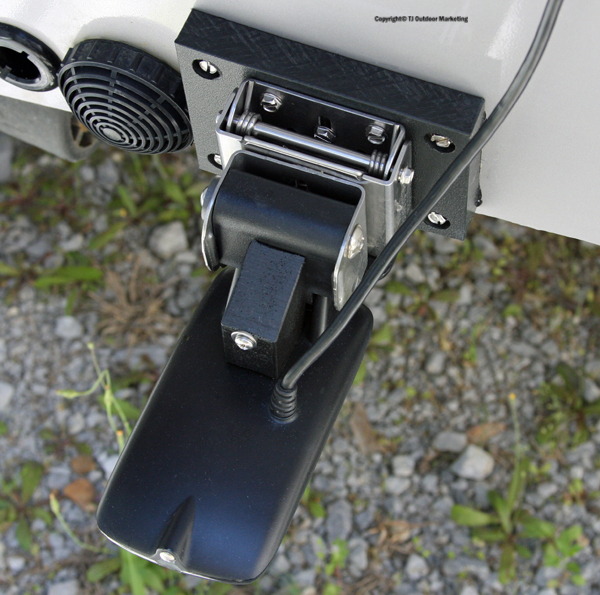 This entry was posted in Fishing and tagged Humminbird, Side-imaging, Tranducer Shield and Protector. Bookmark the permalink. 10 Responses to Transom mounted transducers live dangerously until now. Do you like your G3? We’re seriously considering purchasing one. New, which for us is a big step. I think we were looking at their jon boats. We need the flat-bottom where we end up fishing. And we use our smaller boat for duck hunting- swamps require a shallow draft. 10-4 on that. Caught a lot of fish out of Jon-boats. G3 has a you tube video about their construction. Pretty cool. I’m definitely going to have to get one of these. Hate the rooster tail! How fast can you actually go and still maintain bottom reading? I have used the Spring Bracket before with great success too, it’s a great product. But when I got my new boat, I couldn’t bear to drill any holes in the hull if I didn’t have to. My solution was to install a hole shot plate underneath the jackplate, and mount the transducer to that plate with the “trolling motor bracket” and the “wedge”, both parts also come from Transducer shield and saver. It’s pretty well protected in that location, and I get clean side to side views for the side imaging beams. Great thinking Ken. Thanks for sharing.